Seed and dice about 3 cups fresh, high-quality tomatoes. Toss them with a little kosher salt and sugar. Set over a colander while you prepare the remaining ingredients if possible. If not, drain for a minimum of an hour. You should be left with about 2 cups of tomato. Seed and dice 4 cups fresh, high quality tomatoes. Toss them with olive oil (at C&F we use garlic oil), plenty of kosher salt, and several sprigs of thyme. Spread this mix out on a baking sheet and roast at 350 degrees for about 30 minutes. You want the tomatoes to be dry and slightly caramelized, but not burned around the edges. Peel and slice (with the grain) 4 medium yellow onions. In a large sauté pan, heat 1/4 cup butter. Add the onions and season them with salt. Let the onions simmer and become juicy. Once the situation becomes a bit drier and much of the onion liquid has cooked out, turn down the heat, to its lowest setting and settle in for a long, slow caramelize. To get these onions where they need to be, it could take about 2 hours. You are looking for a medium brown, sweet caramelization. Combine the onions, fresh tomatoes, roasted tomatoes, basil, salt, pepper, and sugar to taste. Keep in mind, tomatoes take a lot of seasoning to really make them shine in applications like this. Spread the filling over the bottom of a blind-baked crust. 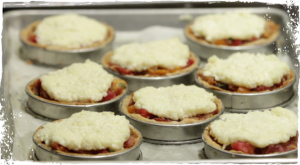 Flatten the topping between wax paper or use your good ol’ hands to create a 1/3 inch thick round of delicious, cheesy topping that spreads nearly to the edges of the pie. Bake at 375 degrees until the top is nicely browned…20-25 minutes. Serve at just over room temperature. At Chef Vivian Howard’s restaurant, the Chef & the Farmer, they make a tight aioli to fold into the cheeses, but you can substitute your favorite brand of mayo to great effect. 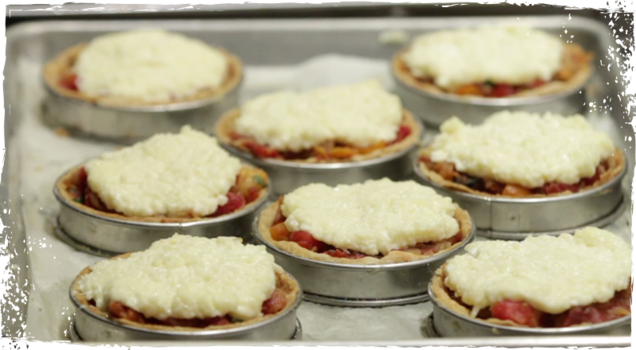 As for the crust… Chef Howard will add the crust recipe when she gather it from Kim, their pastry chef. For now, use your favorite crust recipe or even a frozen crust…and blind bake it! * Purchase Italian Fontina cheese – not Danish as it is not as creamy and won’t melt as well. 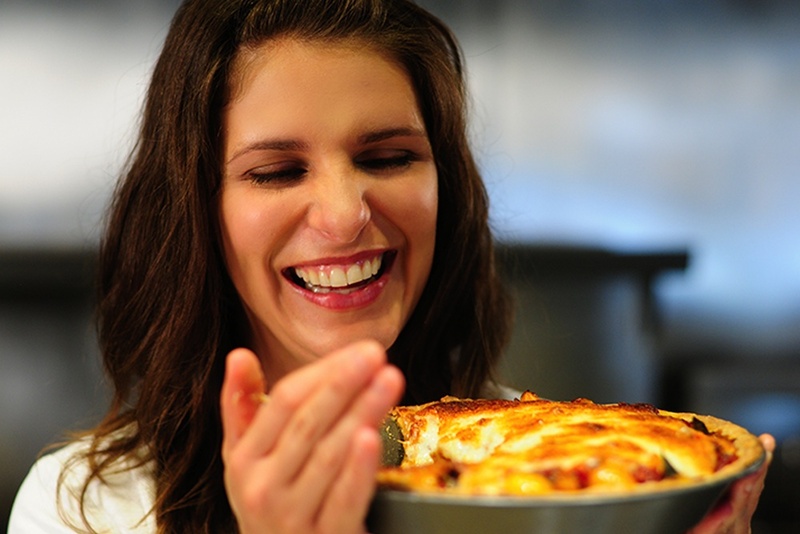 Tip: Don’t heat the cheese beyond its melting point as cheese tends to ball up at higher temperatures. 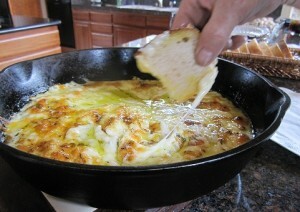 Also don’t let the cheese cool down too much before serving, as it tends to get stringier and tougher as it cools.